I’ve read a lot of historical novels over the last few years but I have to say that hands down, this one is at the top of my list. That’s saying a lot – I’ve read some pretty great stories over the past few months and only one other (well known) author rivals this attempt. What makes this story stand out? Well, for one, it’s not set in England. Second, it’s not set in the Anglo Saxon, Tudor, or Elizabethan period. I find a lot of historical novels are commonly set in these eras and until this book, I hadn’t really read anything set in the High Middle Ages, or Italy for that matter. It was fabulous. I really wish more authors did this, i.e., ventured out of the “England-Saxon-Tudor comfort zone”. Yes, England is great, and YES, there is an abundance of research and literature on those periods but quite frankly, it’s been done… TO DEATH. This book was a welcome break from the usual scenery and trajectory of the typical historical novel. The story is narrated by Corrado, a jester, who unwittingly becomes involved in (and believes himself the cause of) one of the most serious family vendettas in Florence’s history. The book follows a series of twists, turns, and dangerous situations for Corrado as he gives the reader a glimpse of life in thirteenth century Florence during the height of the city’s most violent period. One small and seemingly innocuous act snowballs until it becomes a vendetta of epic proportions. Corrado tries repeatedly to extricate himself from the fray but is pulled back in against his will as events spin out of his control. He pays a heavy price for his unwilling involvment as violence trickles its way down from the great noble families to the lives of common folk and the people he loves. Corrado is a very interesting character. He is poor yet comes into frequent contact with the upper classes by virtue of his profession as a performer. I loved the idea of having a story told from the perspective of a commoner and a jester – it was certainly a different angle. The reader feels for him as he struggles with his conscience and tries to disentatngle himself from the noble families’ squabbles. The supporting characters, Neri and Ghisola try to ground Corrado but they too become enmeshed in his troubles. I really liked their characters, Neri and Ghisola added, not detracted from the story. They provided a backdrop to what motivated Corrado to do what he did in this book. The charcaters in the novel are complex and fascinating. Tinney’s personification of the nobles was refreshing; instead of painting them as two dimensional, shallow and sinister, she adds depth to the book’s most hated characters, like Selvaggia, Buondelmonti, Oddo and Mosca. She manages to make the reader feel conflicted – you hate, yet feel pity for them at the same time. Every main character has many layers, and flaws; no one is all good or all bad and it makes for very interesting reading. The other great aspect to this book is the history behind the vendettas of the Italian nobility.The book was well researched and was of particular interest to me since I heard a paper given at Kalamazoo this year that detailed the history of chivalric vendettas in thirteenth century Italy. The story Corrado weaves deals with the quarrel between several prominent famillies – mainly, the future factions of what would become the Guelphs and Ghibellines. The story focused on three of these noble families: The Buondelmonti, Donati and Amidei. Corrado becomes a pawn for these three quarreling groups and provides another angle to view how the political landscape of Florence developed during this period. A jilted bride and insult to honour turn Florence upside down over the course of one Easter and he is an unwilling participant in the tumult. Tinney also took the time at the end of the novel to provide ample background on the political machinations going on in Florence at the time, to explain things like Italian marriage, the Podesta, political alliances, urban life and even the way time of day was kept. I had a hard time putting book down. If you’re looking for historical fiction that is different, provides a new perspective and a much needed change of venue – this is your book. 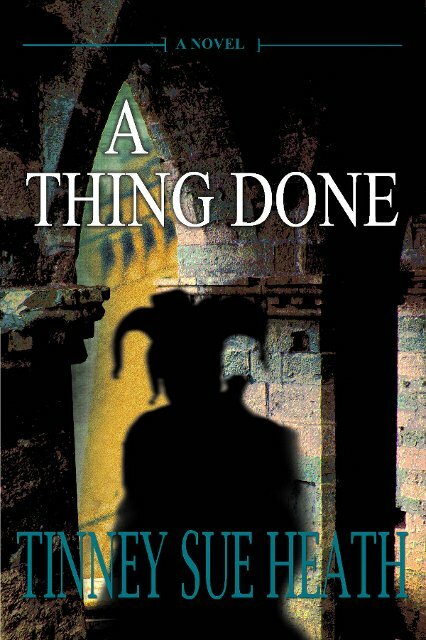 Tinney does a wonderful job of demonstrating how minor, insignificant acts can have far reaching consequences while weaving a great tale grounded in historical events. This is a must read.